Notes: This episode is the first entry in an ONA adaptation of the manga "Apocalypse Meow", and while no other episodes have come out at the time of writing, rumors persist that the subsequent episodes are due for release in the near future. Thus, I write this review as a preview to the full series, and considering the fact that this piece has a self-contained plot, one can think of this as being a one-shot OAV for the time being. Set in Afghanistan during the recent conflict between the Taliban and the United States Military, this is the story of two soldiers on a scouting mission that quickly turns into a desperate rescue attempt. Two self-styled "pros", Packy (codenamed "Cat Sh*t One") and his partner Botansky, must free a group of hostages from an enemy encampment before either they or the hostages suffer a cruel fate at the hands of the Taliban militia. We have before us one of the oddest products of Japan's animation industry: the pilot episode for a CGI series entitled Cat Sh*t One. It's a relatively rare entry in the canon of anime, for although there are a few anime that take place during wartime, Barefoot Gen and Grave of the Fireflies being two of the most famous, this is one of the few that focuses on the actual fighting rather than the psychological effects on civilians. It promises combat and delivers it very well, and this may be the perfect match for an anime fan who's also in dire need of a war movie. But Cat Sh*t One never really tries to be much besides a set of battles, and for that reason I doubt that it will appeal to anyone who has no interest in gunfights. 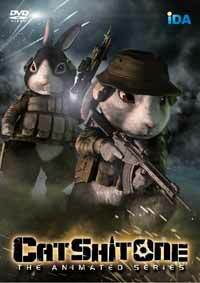 Rather than depicting the soldiers and militia as humans, both the mangaka and the director have depicted them as animals, the American soldiers being rabbits and the Afghans (whether friend or foe) being camels. The animals are all quite well-animated, and occasionally I was amused by certain touches, among them the fact that the rabbits fold their ears down when trying to take cover. However, most films with anthropomorphic animals portray their characters as such for symbolic effect, unless the film is for children, and within this episode's running time, I never could quite decide exactly why this choice was made. Sure, the people of Afghanistan use camels, but is that a solid reason to turn them into their beasts of burden? Other works such as Art Spiegelman's graphic novel "Maus" have depicted ethnic groups as specific animals based on their political relationships and supposed habits, and here, it doesn't make all that much sense. The animals are sharply animated, but putting them in this form seems a bit pointless, and while future episodes may eventually shed some light, I'm a bit puzzled at the present. Cat Sh*t One is solidly written, animated, and acted, but beyond the basic quirk of having anthropormohic soldiers, it never really manages to stand out. I will say that the Japanese voice acting is superb, and the filmmakers thankfully chose not to use any sort of "archetype" American voices for the soldiers. As for the art, let's just say that it works, because it does: everything looks fine, but nothing is particularly beautiful or striking. Cat Sh*t One does not seek transcendence, for it knows it is a war flick and is very content to stick with that, and while this does prevent it from being schizophrenic, it also meant that there I came away feeling a bit like something was missing. "The rest are all terrorists! Kill 'em." This line, sadly, is an excellent representation of the way too many Americans feel, and it is not too far removed from the message of the once-infamous, "Nuke 'em All! Let Allah sort them out" bumper sticker that appeared after the events of 9/11. Whether this line is attempted social commentary or a backhanded poke at American soldiers, nothing in the film, the dialogue, or the imagery ever seems to question this statement, and we're never asked to consider whether the violence is morally acceptable or not, meaning that this episode is worthless as a commentary on war . Who knows whether future episodes will take a different approach, but for now, the show's complete lack of moral stance is a bit unsettling. My essential problem with Cat Sh*t One is that it stirs no emotion in me. It's an entertaining romp with solid animation and writing, along with some likeable-enough characters, and I would never call it a complete waste. It fails to make me feel anything, however, be it happiness, laughter, sadness, or anger, nor does it incite me to ask questions. 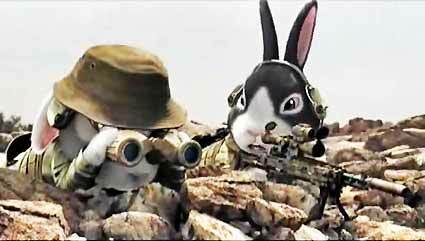 It may work for you if you get a kick out of seeing little bunnies fighting or if you happen to be an afficionado of war films, but I would suggest you look elsewhere if you seek to ponder. Recommended Audience: Not for children. There is a lot of violence, and although none of it is graphic, head-shots and deaths are commonplace. Ironically, the title contains the only profanity uttered anywhere in the episode. Cat Sh*t One © 2010 Motofumi Kobayashi / anima inc.